In Wing Tsun Style, the late Mr. Yip Man was a great Grand Master in the kung-fu world of his time. Having an unusual temperament and selfrespect, Grand Master Yip paid little attention to the mundane vanities of life, viz fame and fortune, nor did he have the rude and scornful attitude of some kung-fu people. On meeting the man, one found no pretension. He had the gift of placing one at ease. His sincerity, warmth and hospitality were evident in many ways. A true gentleman and a scholar, he represented serenity and refinement. His conversations, in the accent of the Fatshan dialect, revealed his carefree and yet friendly character. Born of a respectable family, the wealthy owner of a large farm and houses along the whole length of one street, he should have been a young nobleman leading a sheltered and protected life, never even allowing his hands to get wet with the warm water of spring. Yet, to the surprise of all, he showed a special liking for the art of fighting. So, at the age of thirteen, he received tuition in kung-fu from Chan Wah Shun, whose nickname was “Wah the Money Changer”, a favourite disciple of Grand Master Leung Jan of the town of Fatshan in Kwangtung Province. As Wah the Money Changer had to rent private premises for teaching his followers because he had no permanent site for his gymnasium, the father of Grand Master Yip was kind enough to allow him to make use of the Ancestral Temple of the Yip’s clansmen. However the high amount of the tuition fees imposed on his disciples, usually as much as three taels of silver a month, had resulted in a small number of sudents in his gymnasium. Yip Man, being the son of the owner of the property, became closely associated with Wah. Attracted by Wah’s kung-fu techniques, Yip Man eventually decided to follow him in the pursuit of the art of fighting. So one day, to Wah’s surprise, Yip Man, bringing with him three tael of silver, requested that Wah admit him as a disciple. This aroused Wah’s suspicion of how Yip Man had obtained the money. On inquring into the matter from Yip’s father, Wah found that Yip Man had got the money by breaking his own savings pot to pay for the tuition fees. Touched by Yip Man’s eagerness and firm decision to learn kung-fu, Wah finally accepted him as his student, but did not teach him with much enthusiasm, as he regarded Yip Man as a young gentleman, too delicate for the fighting art. Nevertheless Yip Man strove to learn much, using his own intelligence and the help of his elder kung-fu brothers. This finally removed Wah’s prejudice against him, he then began to adopt a serious attitude in teaching Yip Man the art of kung-fu. During Wah’s thirty-six years of teaching, he had taught, in all sixteen disciples, including his own son Chan Yu Min. Among these disciples of his, Yip Man was the youngest who had followed him and continued to do so until his death. Yip Man was sixteen when his master Wah the Money Changer died of a disease. In the same year he left Fatshan and went to Hong Kong to continue his education in St. Stepen’s College. During the years when Yip Man was attending school, there was one incident which he would never forget – an experience of a failure which turned out eventually to be a blessing in disguise. It was a defeat in a fight which resulted in his obtaining the highest accompishment in his kung-fu career. Being an active teenager, he was well involved with a group of youngsters from the school, who were all more or less the same age and were fond of quarreling with their European school-mates. Having received tuition in the art of fighting, Yip Man very often defeated his European opponents in fights, even though he was smaller in size. He admitted in his reminiscences some time later that he was too proud of himself in those days. One day a classmate of Yip Man, surnamed Lai, said to Yip Man, “There is a kung-fu practitioner in our trading company, a friend of my father, in his fifties. Would you dare to fight a few movements with him?” Yip Man, being an arrogant youngster who had never experienced failure, feared no-one at that time, and so he promised to meet this middle-aged man. On the arranged day, Yip Man, led by his classmate, went to meet the elderly man in a silk company in Hong Kong’s Jervois Street. After greeting him, Yip Man told the elderly man of his intentions. The man, introduced to Yip Man as Mr. Leung, replied with a smile, “So you are the disciple of the revered Master Chan Wah Shun of Fatshan. You are young. What have you learnt from your si-fu? Have you learnt the Chum-Kiu?” Yip Man was then so eager to have a fight that he did not listen to the man and only uttered a few irrelevant words in return, as he was at the same time taking off his large-lapelled garment, getting himself ready for a fight. At this moment the elderly man smilingly told Yip Man that he was allowed to attack any part of his body by any means, and that he himself would only discharge these attacks and would not render any counter-attack, nor would he hurt Yip Man in any way. This only added fuel to Yip Man’s fury. Nevertheless, Yip Man managed to fight with care and calmness. He launched fierce attacks on the man, who discharged them with ease and leisure, and finally floored him, not just once, but repeatedly. Every time Yip Man lay flat on the floor he rose again and rendered a new attack, only to find he had to leave, defeated, in the end. It was later discovered that this elderly man was Mr. Leung Bik, the second son of Grand Master Leung Jan of Fatshan, the paternal-teacher (si-fu) of Chan Wah Shun the Money Cahnger who taught Yip Man. This was to say that the elderly man was actually the younger kung-fu brother (si-dei) of Yip’s own paternal-teacher (si-fu), one of a higher generation than himself, uncle (si-sok) as Yip had to call him according to kung-fu tradtitions. Yip Man should have noticed this when he was being questioned by Leung Bik in the first place, except that he was too conceited to realise it. Once he knew the truth, a sudden thought flashed through Yip Man’s mind – that he might as well follow this M. Leung to further his studies in the art of fighting, as he had begun to realise his own weaknesses in the art. This was a chance he would never let pass. On the other hand, Leung Bik began to realise the potential of this young man, who lacked only experience and adequate instruction. So Leung Bik promised to accept Yip Man as his disciple. From then on, Yip Man followed Leung Bik for years and learnt all the secrets of Wing Tsun Kuen. At the age of twenty-four, Yip Man returned to his native town of Fatshan, having achieved competence in his art. Yip Man returned to Fatshan to pass a leisurely life, being free of all the burdens of life as his family was wealthy. During those days Yip Man spent much time practising kung-fu with his second kung-fu brother, (si-hing) Ng Chung So and Ng’s disciple, Yuen Kay Shan, and maintained a steady progress in his skills. Yuen Kay Shan was nicknamed “Yuen the Fifth” as he was the fifth son of his family. So all the clansmen of Fatshan called him by his nickname, and his real name was gradually forgotten. Although Yuen the Fifth was a little older than Yip Man, he was the nephew (si-juk) in chinese kung-fu terminology because Yip Man was of an older generation, i.e. Yip Man had been learning kung-fu longer. But as they were so closely associated, they forgot the generation gap and became good friends. During the days when he was back in Fatshan, Yip Man began to notice something quite interesting to him and yet in another way rather disturbing. It was that he found himself more advanced in his skills than his elder kung-fu brohters. This provoked complaints from his elder kung-fu brothers, that he had learnt something that had not been taught by master Chan Wah Shun. For this reason he was being accused, especially by those who had been defeated by him, of being a defector from the Wing Tsun System. This resulted in many arguments between Yip Man and his elder kung-fu brothers. Fortunately Ng Chung So successfully explained the situation to the other people. He revealed that their master, Chan Wah Shun, although highly skilled in the art, had not been a scholar, therefore he was not experienced in the art of expressing his view to his students. This of course, meant that much of the theory of Wing Tsun Kung-fu could not be explained properly. Whereas Leung Bik, the son of their Grandfatherly-teacher, was a learned scholar in addition to being a highly skilled practioner of kung-fu. Therefore he could give explicit explanations of the theory of Wing Tsun Kung-fu to Yip Man. This was where the difference between Yip Man and his elder kung-fu brothers lay. 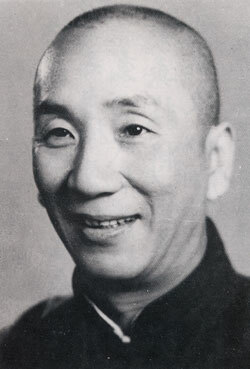 Consequently, Yip Man was well known for his skills after he returned to Fatshan. Yip Man pad little attention to fame and fortune, never showing himself off before other people, and making little or no mention of his heroic deeds in his youth. Yet there were one or two incidents about him that are worthy of mention. These were retold by some eye-witnesses, but with inevitable exaggeration. It was the custom of the people of Fatshan to hold a procession of floats once a year, in which all the wealthy tradesmen, industrialists and eminent people of that town all took part. They organised teams of floats to show themselves off for publicity. The festival usually attracted not only local people, but also sightseers from many neighbouring towns. On the day of the festival, onlookers oured into the streets though which the procession of the floats would pass. It became very difficult for aspectator to find a spot from which he could have a good view of the show. It was during one of these occasions in Fatshan that Yip Man and several young female relatives, were among the spectators for the show. Standing not far away from them was a soldier. Yip Man had a special dislike of this soldier, bearing in mind that in those days, people who joined the services were either vagabonds or outlaws, and that “good youth” as people said, “would never become soldiers”. Yip Man’s female companions were luxuriously dressed, and their beauty and graceful manner attracted the attention of this particular soldier. The soldier annoyed Yip Man as he appoached them and insulted the ladies, speaking disrespectfully to them. Yip Man accused him of having bad manners, which resulted in a fight between the two men. To the surprise of the soldier, Yip Man was not the delicate scholar he expected. This inrudiated the soldier, who drew his pistol and pointed it at Yip Man. At this critical moment Yip Man wasted no time. He quickly snatched the pistol and knocked away the chamber of it with his powerful fingers, leaving the soldier standing frightened and dumbfounded. Before the soldier had time to recover from the shock, Yip Man and his companions were already gone. This incident was later retold by many eye-witnesses, but with much exaggeration, even to the point of saying that Yip Man had broken the barrel of the pistol into two halves. In fact Yip Man was only to be praised for the strength of his fingers and the speed of his actions. In another incident, Yip Man noted for his competence, in a duel with a boxer by the name of Kam Shan Mao from Kianghsi Province in Northern China. Kam arrived in Fatshan and asked for the post of instructor in the Ching Wu Athletic Association of Fatshan. He boasted of his own skill and degraded the standard of the martial artists Fatshan. The directors of the Ching Wu Athletic Association were reluctant to accept him. Nevertheless, he was invited to take part in a tournament, to be held in the Fatshan Theatre, in which he was to fight the famous Yip Man. Yip Man at first refused to take part in such a public fight with this stranger, but, at the earnest request of Lee Kwong Hoi, a famous herbalist physician of Fatshan, he eventually agreed to fight. On the day of the tournament, spectators flocked to the theatre where the fight was to be held. To the disappointment of all, Kam was knocked down by Yip Man only one minute after the commencement of the fight. Kam was declared by the judge, Tam Sheung Chi, to be the loser. The disappointedd spectators became furious and restless, and disturbances at the scene would be inevitable, it seemed. They were calmed down later, only by the organiser of the fight offering them some instant boxing shows by a few other pugilists at the scene. The second time Yip Man fought the fame of the kung-fu circle of Fatshan, was a duel between him and the comedian of the Red Junk – a jung carrying an opera for a tour show. The junk was, at that time, visiting Fatshan. When the opera was not performing, or when a show was over, the comedian of the troupe used to frequent a smoking den – a place where the people of Fatshan could legally smoke opium. Non-smokers also used it as a meeting place. Whenever the comedian of the troupe went into the smoking den, he used to boast about his own kung-fu skills. Once he even demonstrated his “Phoenix-eye fist” in front of the smokers, making a hole in the wall with just a punch. It was in the smoking den that Yip Man encountered this man. The man, being proud of his own skills, insisted on having a fight with Yip Man who refused to accept the challenge. The fight would never have happened if it was not for the persistent urging of the middlesome onlookers. To their surprise, Yip Man put his opponent on the floor with only one punch, giving him a bleeding nose. The spectators cheered Yip Man and asked how he could win the fight so easily. Yip Man told them that, although the Phoenix-eye fist of the man was very powerful, in fact the man had little knowledge of the techniques as used in fighting. That was why the man lost the fight. That was the last time the people of Fatshan saw the comedian of the Red Junk. There was, in Fatshan, an associate of Yip Man, by the nickname of Charlie Wan, who was then badly in need of a large sum of money. Charlie Wan was a pugilist of the Choy Lee Fut style noted for its practical skills of fighting, quite different from those of Wing Tsun Kung-fu. Though they were friends they never discussed martial art techniques, nor did they ever argue over the art of fighting. For this reason, the meddlesome citizens of the town of Fatshan did not know, but were eager to find out, which of the two were the better fighter. One of them had thought out a way to test them at last – that was, to hold a contest between the two of them for fund-raising purposes. This would, in the first place, attract and satisfy large crowds of kung-fu fans, and secondly, would serve to meet the monetary needs of Charlie Wan. Charlie Wan, at first, refused this suggestion, thinking that this would impair the friendship between himself and Yip Man. However, for the sake of easing his own needy situation, he finally agreed to the contest, with the stipulation that there should be a suitable go-between to arrange it. This problem was solved by Lee Kwong Hoi, who agreed to arrange the fight and to be the judge. For the opposition, Yip Man had no objection to this at all, thinking this would not only solve his friend’s problem, but would also promote the art of fist-fighting in Fatshan. For increased publicity, Yip Man even suggested that he would be blind-folded during the fight. This really stirred up much talk about the tournament, and the people of Fatshan became very anxious to know how this man, who had knocked down Kam Shan Mao in the first minute, would fight when he was blindfolded. Some feared that Yip Man’s chance of winning was very small. On the day of the fight, spectators poured into the area. At the order of Lee Kwong Hoi, the judge, the two pugilists began their bout. Charlie Wan took the offensive at the very beginning, while the blindfolded Yip Man, well trained in detecting the intentions of his opponent by the feeling of his bridge-arms, remained in contact with his opponent. Though the attacks of Charlie Wan were fierce and powerful, yet Yip Man managed to dissolve them one by one, and very often succeeded in chasing his opponent and rendering couter attacks. In this way they exchanged punches and kicks, to the great satisfaction of all the onlookers. At last the clever Lee Kowng Hoi, fearing that one of them would inevitably be wounded in the end, declared a stop to the fight. So the fight ended in a draw, admidst a hail of cheers from the spectators. While Yip Man was living in Fatshan, he had, for a time been the Captain of the Detective Squad. He founds his skills convenient and helpful in his job, and, on more than occasion, they had saved his life. There was one incident concerning Yip Man that continues to be told nowadays. Once, Yip Man that continues to be told nowadays. Once, Yip Man was having a chat about kung-fu with some of his subordinates. In his enthusiasm he positioned himself in the Character “Two” Adduction Stance and invited four strong men to pull his legs apart, two on each leg. To their surprise, no matter how hard they pulled, they could not cause the slightest movement of Yip Man’s legs. It was recallled by one of the long-retired detectives of Yip Man’s squad that he once witnessed Yip Man’s amazing strength. This retired detective was a fellow clansman of Yip Man. Several years later, in Hong Kong, his nephew, a local lawyer, became a disciple of Yip Man. The story goes that one day Yip Man was leading his squad in hunting down a gang of robbers. They arrived at a large farmyard, where the robbers were supposed to be hiding. In front of the main door of the farmhouse there was a gate, made of fir trunks as thick as a man’s arm. This gate, known to people as the sliding gate, was meant to stop the intrusion of robbers. So it was extraordinarily strong and compact. Yip Man, seeing that the gate was under lock and chain at that moment, realised that the robbers had made use of it to stop Yip Man and his team of detectives. They were not carrying any tools with them, so Yip Man, without further tought, gave the gate a sweeping kick, which was so powerful that instantly four of the fir trunks forming the gate were broken. They were then able to break into farmhouse and arrest the robbers. Once, Yip Man, as Captain of the detective squad, was chasing a thief who had just ascended to the flat roof of a house by means of the inside stairway. When Yip Man came up onto the roof the thief had already jumped over the parapet to the roof of that house. Yip Man, risking his life rather than allowing the thief to escape, followed suit by jumping over the space between the two roofs. The thief, seeing that Yip Man was hard after him, suddenly slammed the door of the roof stairway towards Yip Man, who had just landed in front of it. This scared all those who were watching him, as the door might force him back to fall off the edge of the roof. But they were wrong, for Yip Man’s upper trunk only slightly swayed backwards, and he was able to retain his balance. After this, the people of Fatshan were even more convinced of Yip Man’s competence in Wing Tsun Kung-fu. During the las few decades, Yip Man was highly rated, in the art of fighting, by the people of Fatshan, but he never had the slightest thought of teaching his skills to anyone, always keeping the commandment of Wing Tsun, that ‘to spread it is in contrast to the wishes of the founder’. He never inteded to pass his skills to anyone, not even to his own son. He used to think that Wing Tsun was a deadly form of martial art. The more he knew of the profundity of Wing Tsun Kung-fu, the more he never imagined that he would eventually become an instructor of his art. During the Second World War, when the greater part of China was under the military control of the Japanese, Yip Man’s farmland was ruined and he was finding life difficult. Soon the Japanese arrived in the town of Fatshan, and Yip Man’s fame soon reached the ears of the Japanese soldiers, who suggested that they would invite Yip Man to be their instructor. A national feeling and a hatred towards the invaders forced Yip Man to turn down the invitation of the Japanese. After the war, Yip Man moved to Hong Kong, taking with him his family. His self-pride and unusual temperament, coupled with the fact that he was born of a wealthy family, made it very difficult for him to find a suitable job. Therefore he had to content with living in poverty. In 1949, through the help of Lee Man, a very close friend of Yip Man, who was now the clerk of the Association of Restaurant Workers of Hong Kong, Yip Man was offered the post of kung-fu instructor of the Association. After a great deal of persuasion, Yip Man accepted the post. At first, members of the Association did not pay much attention to Yip Man, nor did they have much regard for what he was teaching, as Wing Tsun Kung-fu, unlike the “long bridges and wide stances” of other kung-fu styles, was not very attractive at first sight. Besides, Yip Man, like his own master, did not wish to boast about his skills, not to mention taking part in public displays. That is why Wing Tsun Kung-fu ws not well known in that time. After two years serving as the instructor for the Association of Restaurant Workers of Hong Kong, where he had only a few students, he founded his own gymnasium in the district of Yaumatei in Kowloon and began to admit students, who had followed him for the past two years, came to offer help in running the gymnasium. It was then that Wing Tsun Kung-fu began to draw the attention of kung-fu fans. Later, when more and more students came to him, he had to move his gymnasium to a larger site. Yip Man’s fame, which ran fast, and the practical value of Wing Tsun Kung-fu, were especiallly admired by members of the police force, of which more and more attended his gym. As his last effort towards the promotion of Wing Tsun Kuen before he retired from teaching, he founded, in 1967, with the help of his students, the Hong Kong Ving Tsun Athletic Association. Two years later, in 1969, the association sent a team to participate in the First South East Asia Kung-fu Tournament, held in Singapore. The results of the team were not satisfactory, so he opened more classes and lowered the tuition fees for them. Thus, by turning classes for the privileged into classes for the common people, he brought Wing Tsun Kung-fu nearer to public interest. In May 1970, when the classes in his association were firmly established, he decided to retire from teaching, and to enjoy a quiet life, having first passed all the teaching affairs of his gymnasium to his favourite disciple, Leung Ting. After that time he was usually to be found having tea, alone, in a tea-house, in the morning, afternoon or even in the evening, or else sharing a laugh and a few jokes with his disciples, always forgetting that he was their master. “Why put on airs? You are in an important position if people respect you.” That was his philosophy. Between 1970 and 1971, Bruce Lee, one of Yip Man’s disciples, became a famous super-star in kung-fu films. Although this martial arts actor was noted for his Jeet-Kune-Do, yet it was known to many people that he had been a disciple of Yip Man for a certain period. Yip Man, on the other hand, never felt proud of having had this super-star as his student. Whenever people praised him for having taught Bruce Lee, he only replied with a smile. He seldom refuted people who made unjustified comments or errorneous conceptions about the theories of Wing Tsun Kung-fu. Truth is truth, and Yip Man is Yip Man; it makes no difference to the standing of Wing Tsun whether he had taught Bruce Lee or not. In 1972, fate had caught up with this carefree old man. A medical check-up revealed that he was suffering from cancer in his throat, which had stripped him of his physical shape and strength. Yet he was fighting the disease with his powerful will, hoping all the time that he would recover from the desease one day. He kept on going to the tea-house or dining out in the evenings with his disciples. He never uttered a groan in front of his students, and his students knew that their master did not like them to comfort him with fine words, bearing in mind that the old master always regarded himself as a determined man. He was at one instance admitted to the disciples, declared that he could not live much longer. Yet Yip Man defeated fate, for, after on week, he improved and returned home again. But to all his respectful disciples, their master was doomed. On the 2nd, of December 1972, Yip Man the Great Grand Master, eventually passed away, leaving behind him a great Style of kung-fu and a fascinating collection of memorable, Wing Tsun, incidents. Bruce Lee was one of the best known among the students of Yip Man. Bruce Lee met Grandmaster Yip Man in Hong Kong, when he was a student at St. Francis College. Bruce Lee’s father, Lee Hoi Chuen, was a good friend of Yip Man. Both were refugees from Fatshan. Because Bruce Lee’s father and Yip Man got on so well together and Bruce Lee showed a great deal of ambition and commitment to his martial arts studies, Grandmaster Yip Man made a special effort when teaching Bruce Lee. However, after just under three years Bruce Lee was unable to continue his WingTsun lessons, as he had to leave Hong Kong to begin his academic studies in America. Bruce Lee’s farewell from Grandmaster Yip Man was far from giving the impression of a final separation between student and master, however there were already signs of disagreement. Before his departure Yip Man reminded Bruce Lee that Kung Fu was one of the highest Chinese arts, and that the Chinese must keep these techniques to themselves in order to defend themselves and maintain good health. And that the techniques of Chinese Kung Fu should therefore not be shown to foreigners without reservation. Bruce Lee promised to act accordingly, however as soon as he arrived in America he opened a martial arts school, accepted foreign students and taught them WingTsun techniques. This greatly astonished and disappointed Grandmaster Yip Man. Bruce Lee was resentful when he returned to America. He ceased teaching WingTsun, as he now saw clearly that he would never become the Number 1 in WingTsun. In order to continue his career he was obliged to found a new style of which he himself was the creator. Accordingly he now called the techniques he taught his students Jeet Kune Do. In reality his Jeet Kune Do techniques were mainly WingTsun techniques combined with Tae-Kwon-Do and Karate, a little western boxing, Judo, northern Praying Mantis Kung Fu etc.. The theories he expounded in periodicals, books and magazines were mainly the theories of WingTsun, together with Chinese philosophies such as Taoism. There were also ideas from western boxing and Judo. When Bruce Lee became famous with his Jeet Kune Do, Yip Man no longer spoke about him and was also displeased if others mentioned Bruce Lee in his presence. In fact the conflict between Yip Man and Bruce Lee was due to their completely different upbringing. Their attitudes to life were too different. Yip Man had been brought up in the traditional Chinese way and was a follower of Confucianism. He was a great lover of Chinese culture. He was also strict, had a strong will and was able to take what fate had in store. Although he was always poor as a police officer and Kung Fu teacher, he was content and accepted his way of life. Bruce Lee, however, had already been educated in an English school in Hong Kong before he went to the USA to study philosophy. Practical, material things were of great importance to him. He fought for fame and fortune all his life. He achieved both, but was unable to take either with him when he died.